It's morning once again for the cheftestants and they go about their usual routine. Jeff works out while enjoying the foggy view. We are spared shots of Ariane shoving cereal in her maw and instead are treated to coffee drinking. 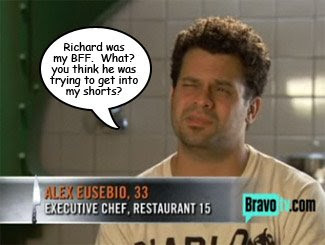 And Alex laments the loss of his new buddy, Richard, with whom he had gotten really close in the first few weeks of filming. Really close. Richard left a long, heart-felt letter for Alex, who decided to read it to Jamie and Carla. 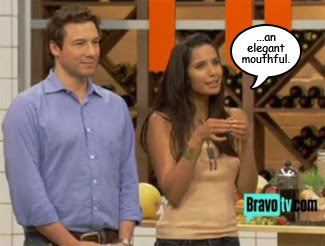 Later, at the hallowed Top Chef kitchen, the cheftestants enter to find Padma standing next to someone who is actually taller than her, for once. She introduces him with great fanfare. Beside the fake Italian and Padma is a table laden with the ingredients for breakfast, which strikes fear into the heart of the remaining member of Team Rainbow. Sausage-like things at any time of day are probably quite abhorrent to little Jamie. ...jokes ensue. Or they should have. Padma and Rocco taste everyone's offerings. Few get both the concept of "breakfast" and "amuse bouche" correct. 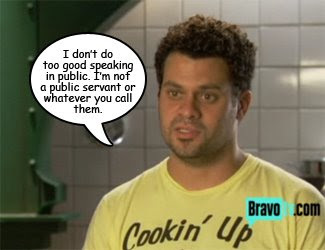 Rocco likes Stefan's, Jamie's, and Leah's dishes, and because Leah is the only one of the three who presented something that was exactly one bite, Rocco gave her the win. Also a copy of his latest cookbook. She, of course, was ecstatic beyond belief. And I'm making that up. She also gets immunity in the Elimination Challenge. Fabio, who made a sweet dish with a too-rich espresso shooter on the side, was bitter. The Quickfire was a little difficult but the Elimination Challenge will be a bit trickier. Ok, a whole lot trickier. The cheftestants must present themselves to the public by appearing in a 2.5 minute segment on the Today Show in which they demo a dish while answering questions and being their charming selves. You should just pack your knives now, Alex. 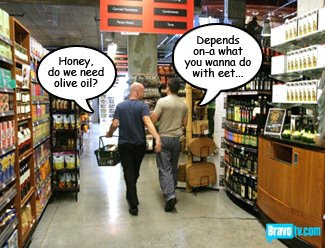 The chefs hit Whole Paycheck to buy the ingredients for their demo dish. 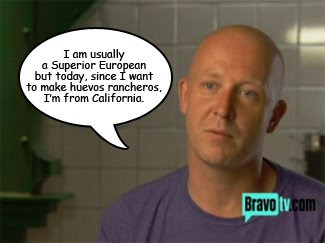 Fabio goes behind the fish counter and cut his own tuna, then copycats Gene and Hosea do the same. Once back at the GE Monogram-equipped kitchen, the chefs get an hour to prep their demo. When time is called, each in turn gets to do a pretend 2 1/2 minute segment with Gail, Rocco, Tom, and Padma standing in for the Today Show 4th hour ninnies. 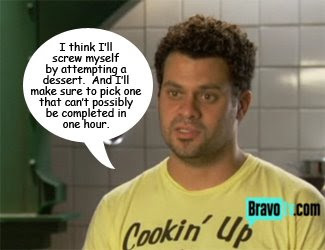 Several chefs aren't able to finish in the time alloted. Alex is one of them. Not only that, his creme brulee did not set (I'm betting it was still hot, too). He explained his deficiencies. The most successful demos and dishes were Ariane's watermelon salad, Fabio's tuna, and Jeff's weird foreign cabbage-wrap stuff on a baby poop smear. The judges thought that Fabio was a "dream guest" and Gail wanted to "spend all day with him." 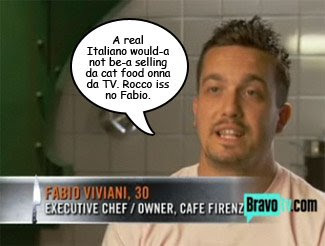 Hope your fiancé doesn't get jealous of hot Italian chefs with funny dreamy accents! Rocco commented that Carla had a nervous energy that made him uncomfortable. No, Carla? Really? Daniel's mugging for the camera was too over-the-top. Leah was lackluster and lucky she had immunity. However, the three least-favorite demos belonged to Alex's creme brulée, Jamie's undercooked duck egg salad, and Melissa's spicy shrimp. After delivering the verdict to the chefs in the stew room, Padma dismisses them until morning. 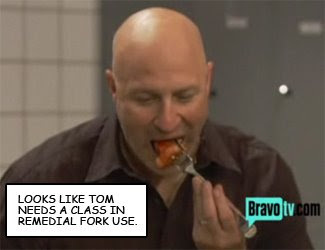 In the middle of the night, Tom wakes the top three chefs. He tells them they are going to 30 Rockefeller Plaza to cook their dishes for the Today Show ninnies who are going to pick the winner of the challenge. "WTF? It's 2:30am, dude!" was basically Jeff's comment. 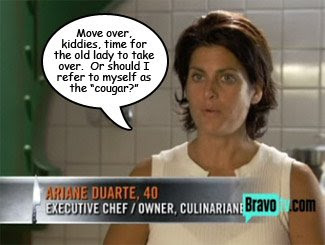 Ariane took the news a little more positively. They do their work in the kitchen of the Sea Grill, the restaurant down by the skating rink. Soon enough they are in front of a small television, watching their dishes being served to Meredith, Kathi Lee, et. al. for tasting. 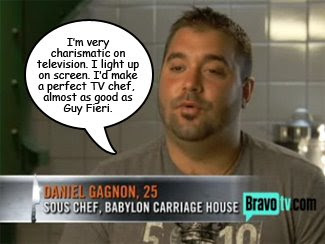 Back at the apartment, the rest of the chefs get to watch the show on a huge flat-screen model that has suddenly and mysteriously appeared in the living room. 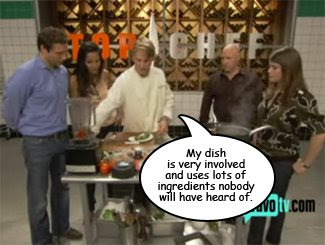 Ariane's dish goes over well with the girls, as does Fabio's. Jeff's not so much. Back at the Top Chef Kitchens, Rocco presents Ariane with a little gift. Nothing makes him happier than tools, so he picked out about two dozen of them (Alton Brown would call them uni-taskers) for her. She also gets to do an actual Today Show segment the morning after the episode premieres, which would be...today. Tom didn't actually say that to Jeff, but you know he wanted to. The bottom three - Melissa, Alex, and Jamie - faced the music. It was hard to pick the loser, since all three did so poorly. 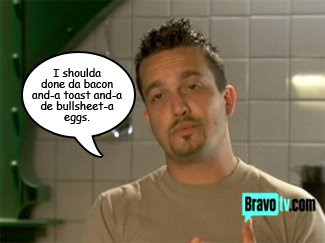 Jamie's duck egg was not only undercooked, but she also had a petulant air about her when criticized. Melissa's use of habaneros was ill-conceived. 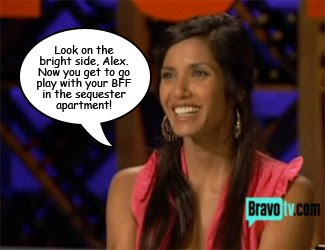 But Alex's decision to make a time-consuming dessert was his fatal flaw, and Padma asked him to pack his knives and go. This was a very clever post. I'm going to be watching you if I remember to bookmark. I'll bet Jaime likes a sausage Patty. 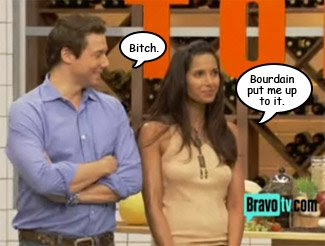 Still crying over Padma's throbbing comment. "It's my worst nightmare to be face with a table full of sausages so early in the morning"
you made me spit out Beaujolais! *appreciated Jeffy's attempt to off K.L., however. And nothing makes Rocco happier than tools? And not that he didn't deserve it but Alex so got 'The Edit'. Early on he's reading aloud and we both go 'who's he?!' and by the 20 min mark we knew... ah, yes, he's 'The Loser'. You're better than TC, minx! Hey gal, I don't miss your post. Too funny. Thanks for taking the time to put this together. I laughed at how unexcited they were about Rocco being there. Usually they have one of the contestants gush over the week's guest, saying how they really admire them, how they're brilliant, etc. This time it was like, oh yeah that guy, I've seen him.